PrJSC Volodymyr-Volynsky Poultry Farm (Volyn region) will invest EUR 38 million in the construction of a new poultry processing facility, which will allow doubling production, director general of the company Alina Sych has said. According to her, the capacity of the new workshop will be 13,500 broilers per hour. Construction is to be completed in a year or two. The company will produce goods under the Epikur brand at this facility: poultry grown without antibiotics and growth stimulation. "The monthly increase in the sales of Epikur poultry is about 43%. We grow 4.6 million birds. As the demand for our products is growing, we start building new facilities to raise production. Within the total production by the factory, the share of Epikur is more than 30%, the rest is grown according to the standard technology," Sych told Interfax-Ukraine. In addition, Volodymyr-Volynsky Poultry Farm actively implements alternative energy projects. 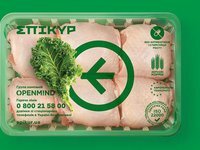 PrJSC Volodymyr-Volynsky Poultry Farm is a Ukrainian-Dutch enterprise, part of the Openmind group of companies. The factory's infrastructure includes 100 poultry farms, a processing workshop and a feed mill with a capacity of 10,000 tonnes per month.